The 10 Best Ice Cream Parlors in Alabama! What better way to cool off after a long, hot Alabama day than with a cold scoop of ice cream? Even if it’s not so hot, ice cream is the best sweet treat. From shops serving up a variety of flavors and homemade ice cream cakes to traditional parlors offering soda fountain delights, the ice cream spots in Alabama will hit the spot. Here are the 10 best in the state. From the first bite to the last melty dollop, you will not be disappointed by Edgewood Creamery’s delicious flavors. Their impressive list of flavors will bring you back again and again. Try one of their perfectly made ice cream cakes for birthdays and whatever events life brings. For a different kind of icy treat, check on Steel City Pops. From refreshing, fruity popsicles to dreamy, cream based pops, Steel City continues to impress with their creative treats. A quirky and fun atmosphere to boot, Matt’s Ice Cream will keep you coming back for their creative scoops and frosty deserts. With over 40 handmade flavors to choose from, you’ll find something for everyone at Matt’s. At Whole Scoop Ice Cream Shop, hospitality is the main ingredient. The family friendly shop engages you from the minute you step in the door, from their list of frosty treats to the local art that done the walls. For an extra special treat for a birthday or anniversary, order one of their homemade ice cream cakes. For great ice cream at a great price, check out Scoop’s in Gulf Shores. Aside from their selection of delectable flavors, their banana splits are a true stand out. The family-owned shop has a welcoming atmosphere for families of all sizes. If milkshakes are your ice cream treat of delight, you cannot pass up Trowbridge’s in Florence. Their creamy shakes stand out on a menu of tasty ice creams and banana splits. Enjoy their relaxed atmosphere for desert out with the family. 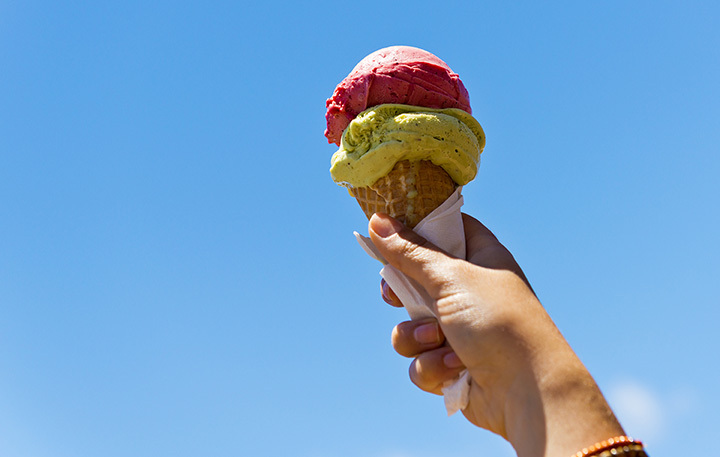 For endless flavors of ice cream and other dreamy treats, try Andy’s Ice Cream in Orange Beach. The local shop has a cozy atmosphere and friendly staff that give the feeling of home. Just off West Highway 98 hides the quaint, nostalgic Stacey drug store. For a step into the past, visit the old-time parlor and enjoy their whimsical ice cream and fountain treats. The service and classic feel will keep you coming back. Cammie’s is an old-fashioned parlor with a friendly flair. From Holland sodas to decadent Old Dutch Splits, Cammie’s has a treat for everyone. This family friendly restaurant parlor has some of the best service in Alabama. With so many varieties of ice creams it is hard to pick, but if you’re into banana splits, La Rue’s is tops.